I woke up Christmas morning to what was perhaps one of the most horrible days of my life. I could feel the fear coursing through my veins and pumping into my heart, all I wanted was to take my 12 month old back to the shelter where I knew we would be safe. I rolled out of my sisters bed that we had shared that night and checked on my son. I honestly don’t even remember much more of that morning. I’m guessing we opened gifts and ate breakfast, although I do remember there wasn’t much for me or my son. Our Christmas was all wrapped up underneath the tree at my house, the one place I wanted to be the least. I decided to stay at my parents house that night rather than the women’s shelter I had checked in to 3 days earlier, after all, it was Christmas. I remember most how frightened I was that night that my then husband or father in law would find out where I was. I had visions of them breaking in through my sisters window in the middle of the night and taking my son from me. I had parked blocks away down a small forgotten street and carried my son through all the snow in an effort to keep them from knowing where I was. All I wanted to do was to get back to the safety of that shelter. There was a part of me that thought about my then husband, sitting in our house, all alone, with the Christmas tree and all our Christmas presents. My heart ached for him, a little. Still, I knew I was making the right choice and that going back was not an option. I had to turn off my emotions in a sense, and instead focus on survival. I couldn’t dwell on those thoughts or worry about him, not any more. My safety and future as well as that of my son were at stake. I packed everything up and drove back to the women’s shelter. I walked up the four flights of stairs and in to the empty shelter, my son and I were the only ones who were currently seeking shelter. It was quiet and lonely. There was at least one intake worker at the shelter at all times, a woman could come seeking shelter at any moment, it wasn’t just a Monday through Friday type of deal. She asked where I had been, and I explained that I had stayed at my parents house for Christmas Eve. She berated me telling me that I could be kicked out for not coming back to the shelter before curfew the previous night. I fumbled around in my head and remembered checking in and being told of the 9 o’clock curfew. I honestly just thought that if I wasn’t back by curfew time, that I would have to stay somewhere else that night, I didn’t realize being gone past curfew was grounds for being kicked out. Luckily, she forgave me my misunderstanding and I was allowed to stay. She brought me several age appropriate toys that had been donated by complete strangers. She explained that usually the kids at the shelter only get one toy each for Christmas, but since my son and I were the only ones there, she gave us a few more. She asked if I wanted to wrap them. I don’t know if I wasn’t in the Christmas spirit or if it was just because my son was 12 months old and I figured unwrapping gifts wouldn’t be such a big deal to him. I declined and took the toys out of their packaging and gave them to my son. It was shortly after that that more women some alone, and some with children began to check in to the shelter. Since that day, I have invested nearly a decade of my life, and thousands of dollars in to learning everything I could so I could truly help others, and I am continuing to do so. 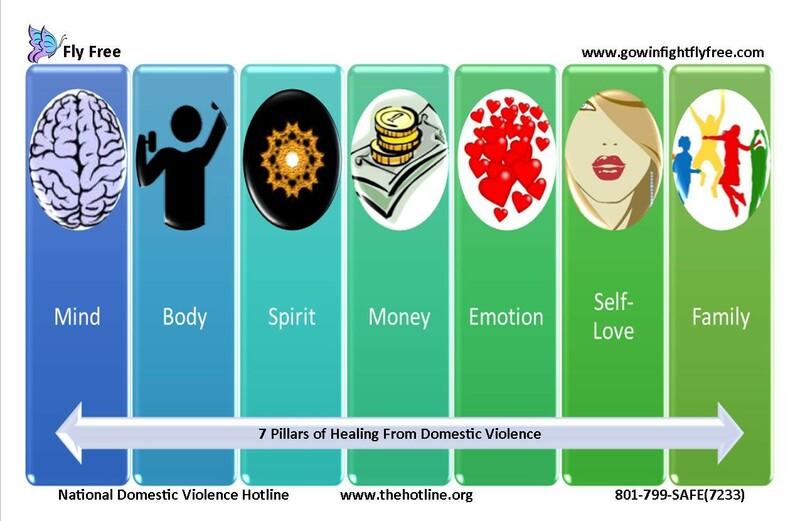 The 7 Pillars to Healing from Domestic Violence covers the 7 types of abuse, and how to heal from each one. 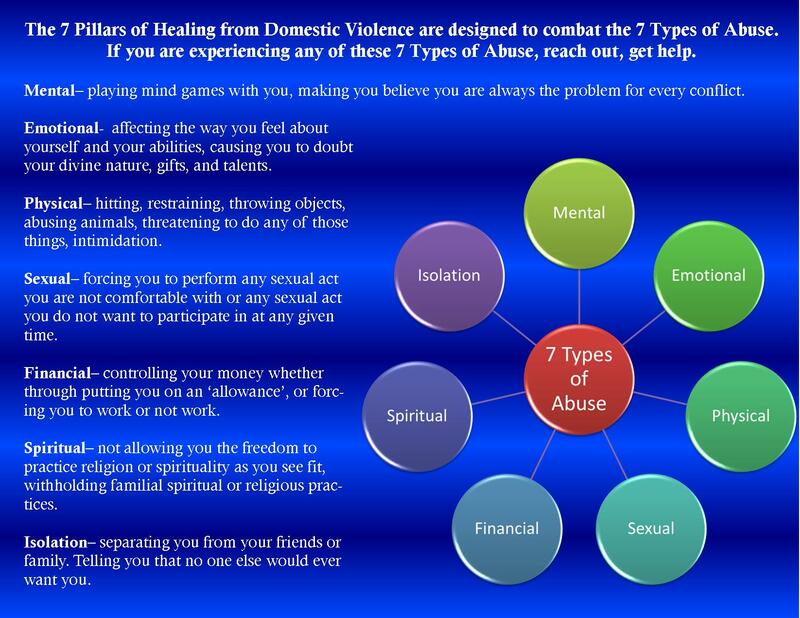 I am continuing to expand on these 7 pillars and will be releasing an in depth program soon.